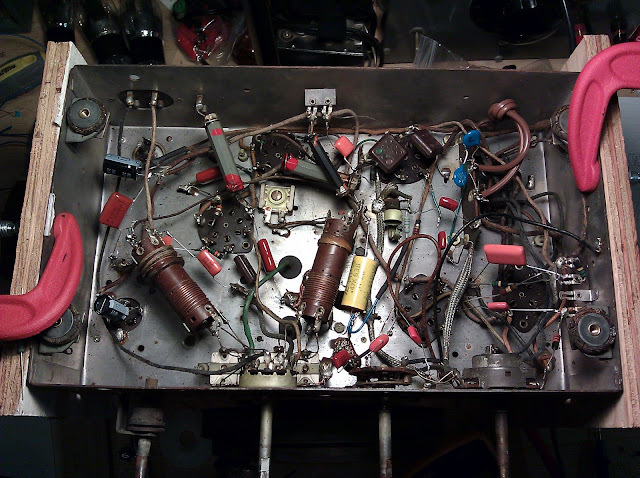 Continuing to restore the Grunow 5-U chassis that’s on my bench, we’re picking back up with replacing the old capacitors. 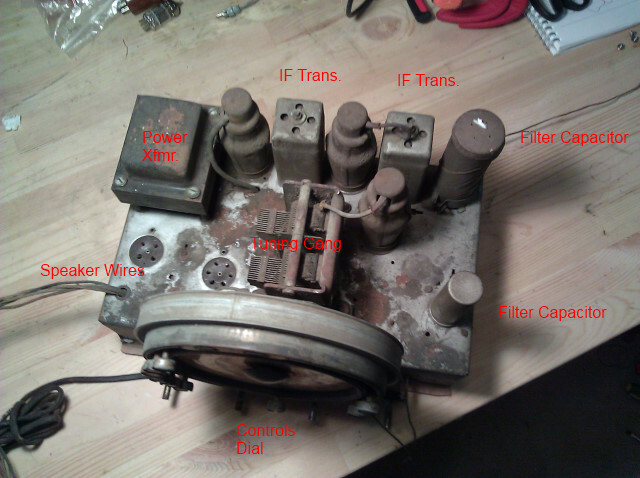 In part 1, I identify the components of the antique radio and give an overview. In part 2, I checked out the durable components such as coils and transformers to make sure the radio was even worth attempting. Feel free to revisit one of the previous segments to catch up on anything you missed. 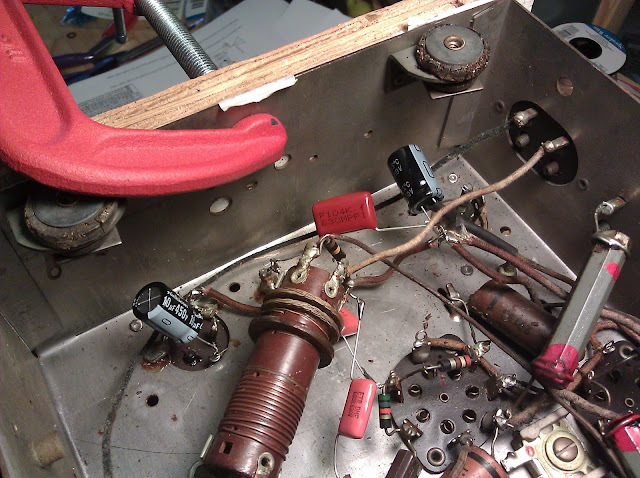 When we left off, the radio chassis was on my bench and I’d completed checking all the coils and transformers. A couple of controls (the band switch and volume/power switch) will need some cleaning or replacement attention, but we’ll get to that later. Otherwise the radio looks to be in good physical condition, with no open windings or broken coils, so it’s on to the real work! First thing’s first: some minor updates. The power cord originally installed 74 years ago was badly cracked, frayed and splitting – unsafe to operate in that condition. I’ve replaced the line cord with a brand new, UL-listed replacement with a polarized NEMA 1 plug, the standard household appliance cord type. Wall sockets are polarized in most modern homes, with the smaller blade on the plug carrying the current and the wider blade tying to your home’s Neutral line. It’s a best practice to always switch the “hot” side of the AC cord, so I installed the replacement with the narrow blade connected to the power switch. While in replacing the power switch, I also made a circuit modification which improves performance and reduces noise. I connected two 0.05uF X1Y2 safety capacitors, one from each side of the line to the radio’s chassis. Safety capacitors are designed to fail-open, rather than fail-short as many other types do, which in the event of a fault keeps the radio from shorting out. This modification serves two purposes: it reduces interference from the power line by diverting it to the circuit ground, and it also provides a partial RF return path for the antenna coil in the absence of an external ground. In most radios around this age, it was necessary to connect both a long wire antenna and a solid grounding rod. The chassis and antenna grounds tie together, and radio waves travel down the antenna, down the primary of the antenna coil to chassis and then into the earth. Without a solid ground connection, performance was reduced. By coupling the chassis ground to AC Neutral, which connects to Earth Ground at your home’s service panel, the radio will have better reception when not attached to a physical ground. Continuing on from there, I worked the chassis roughly left-to-right replacing capacitors as I went along. 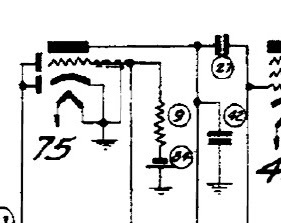 Most caps are marked with their values, but there is a full parts list on the schematic for the ones where the markings are no longer readable. 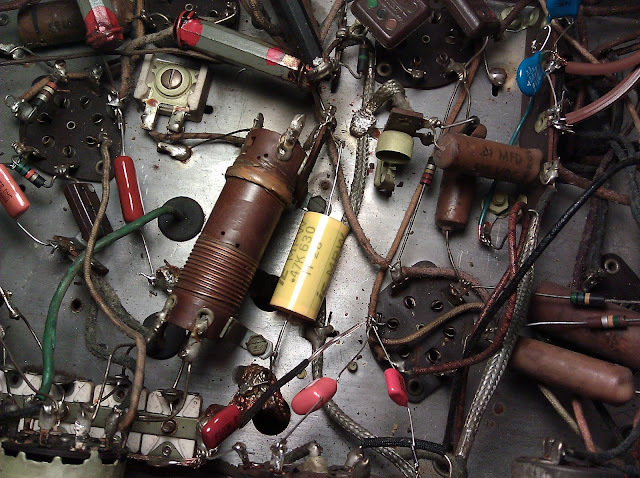 While under the radio’s chassis, it’s easy to see the repair history of the radio. The original capacitors were waxed cardboard tubes, labeled with the word “Grunow” in script. One is visible above just below the blue safety caps. There are, however, several other capacitors with different markings, Aerovox Tubular Capacitors. 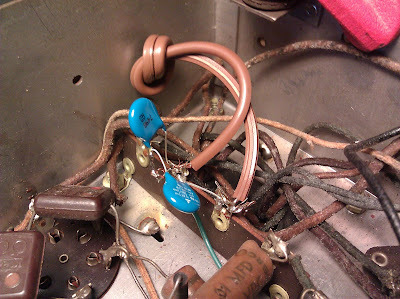 These are evidence of the radio being serviced at some point in its past. 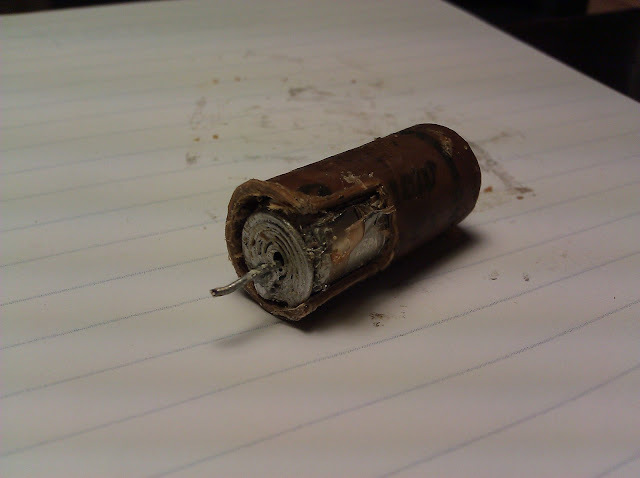 Here you can see a cutaway view of a 0.1uF antique capacitor. Inside the wax-coated cardboard tube are concentric layers of metal foil separated by a thin insulator. As the years carried on, moisture penetrated the wax and causes corrosion which leads to leakage and eventually, short circuits. While replacing parts, I carefully de-solder one lead at a time, or if the terminal is too crowded or looks to fragile (tube socket tie points with many connections), I’ll snip the wire leaving about 1/4″ and bend it into a loop, then use that as a new tie point. This lead-looping is a standard repair. The new signal capacitors are much smaller, and will probably last forever. They are all rated at 630V and are all metalized polymer construction. The black cylinders are the replacement filter capacitors – approximately the size of a thimble, compared to the largest of the top-mounted cans that’s about the size of a cardboard toilet paper roll. Materials science has really come a long way. In the top right, the can is insulated from the chassis; on the left, the negative goes directly into the chassis. Both provide filtering from the power supply. 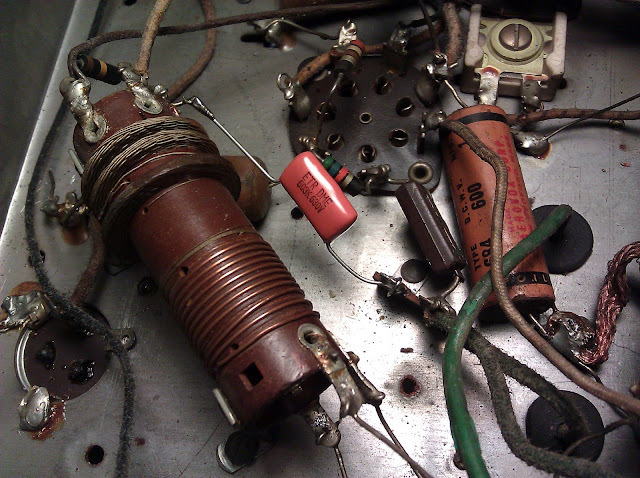 The yellow cylinder in the center of this shot is another capacitor. The 0.5uF model previously in its place was bad, and instead of adding a wire lead to the end of a smaller capacitor, I used one in a different packaging which allowed me to make the connection without additional wire. The replacement is 0.47uF. Manufacturing tolerances on antique capacitors were typically on the order of +/- 20%, so any value from 0.4-0.6 is just perfect; in this case the replacement is only “off” by 6% and will work perfectly. This radio was also equipped with a feature called a Bias Cell. At this point in history, the entire field of electronics had only existed for about 20 years and so scientists and researchers were still determining properties of vacuum tubes and circuit design. Early radios applied a small negative charge, about as much as a watch battery, to the grid (input) of certain tubes especially in the audio sections. For more detail on why this was necessary, I’d encourage you to pick up Elements of Radio (1950) or Radio Physics Course (1933) but suffice it to say as circuit design improved it became apparent these bias cells were no longer needed within just a couple of years of their introduction. I’ve modified the circuit to eliminate the bias cell entirely. This was accomplished by changing the 1M grid resistor to a 4.7M grid resistor, and jumping across the battery’s terminals. It’s since been removed. Some people like to replace the outdated carbon-zinc battery with a modern lithium watch battery, or rejuvenate their old cells, but there’s no benefit for either of those approaches over modifying the circuit to use a later design. Replace all wax and electrolytic capacitors. Check resistors for drift and replace as necessary. Clean or replace band switch. Clean or replace power switch and volume control. Replace power cord with polarized power cord for safety, and add interference-suppression to the power line input. Add inline fuse on the power transformer primary for safety. Adding an isolated auxiliary input (RCA jack) for playing an iPod or other music device. Replace bias cell with lithium battery or eliminate and replace with 5 Megohm resistor. Replacing rubber chassis and tuner washers to ensure proper alignment. Coming up next, I’ll be verifying the resistors and the condition of the tiniest 3 capacitors which are Mica construction and don’t typically need to be replaced. 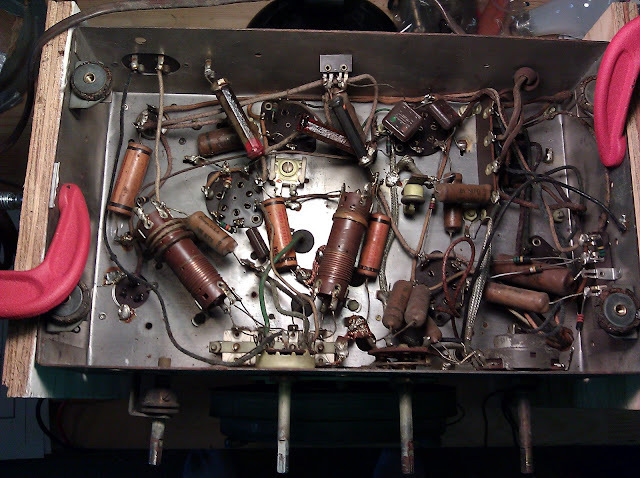 This entry was posted in Projects, Radios and Tubes, Vintage and tagged antique radio, fixing an old radio, grunow, grunow 5-u, grunow 586, grunow 589, grunow radio restoration, repair, restoration, teledial, tube radio. Bookmark the permalink. I have 1-Aerovox CP 1 value 5100, 1-CP 1 value1300 and 1-Aerovox CP 1 value 910 resistors. NOS. 2 are in the original plastic tube sealed..the 910 has the same tube but has been opened. Anyone want to buy them..contact me.